Most of the time, superhero play, when you really study it, is negotiating ("Are you a good guy or a bad guy?" "I'm on your team," "This is our hideout!") followed by bluster ("We will defeat you!" "I can block your punch with my force field," "You can't catch me, I'm too fast!") accompanied by powerful poses and a bit of running. It's the sort of dramatic play I remember from my own boyhood, in many cases right down to the same superheroes and villains. The one thing I don't see so much of, even as it tends to dominate the comic book pages and movie screens, are fisticuffs. Most of the fighting is done remotely, via "blasts" or "webs" or guns of various sorts. There are a lot of evasive actions like turning invisible, activating force fields, flying, turning into flame, or otherwise evading the attacks of one's foes, but very rarely do I see the kids I teach standing toe-to-toe throwing fantasy haymakers. Of course, I understand it because that's the way we played fighting when I was a kid. I mean, getting "hit" by someone's blast carries no real risk, whereas even a pretend punch will hurt if it accidentally makes contact. Everyone knows that, either via experience, observation, or mental experiment. It's the reason that one class a couple years back decided to ban "swinging weapons" (swords, whips, etc.) while retaining their right to bear "shooting weapons." And whenever someone does pretend to fight with his fists, it often leads to real conflict because there is a fine, previously unknowable line between a pretend punch and a real one. A pretend punch may be an exciting part of the game, but a "real" one, as interpreted by the party on the receiving end, one that makes someone cry or angry, threatens to destroy the entire game. Either the hurt kid quits playing or the strong emotions attract the attention of adults who invariably breaks things up. Children know this even if they can't usually articulate it. As Peter Gray points out in his book Free to Learn, the power to quit is one of the most important and overlooked aspects of cooperative play. 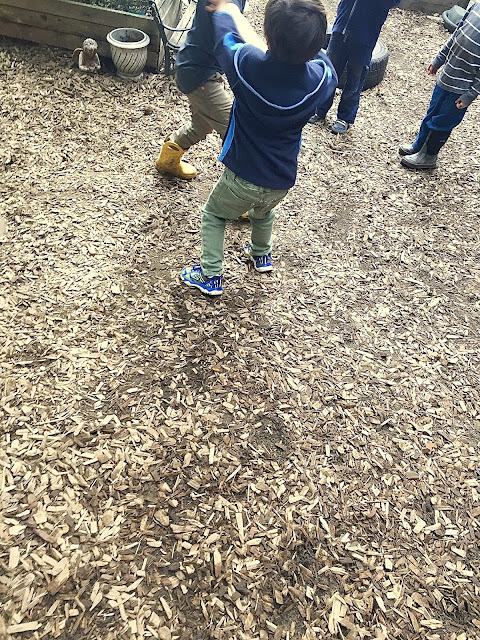 That freedom to just walk away if it's no longer fun is a powerful regulator because the drive to keep playing is so strong that children will do whatever they can to avoid having their good time come to an end. And contrary to appearances, these sorts of combative games, which are central to the play of all mammals, are highly cooperative endeavors. When you really listen and watch children play these games, rather than just paying attention when someone is crying or angry, one finds the children engaged in a rich, intense, complex social activity one in which agreement, or at least the quest for agreement, stands at the center. During our final week of school, I was watching a group of guys negotiate their way through a kind of impromptu fist fight choreography. 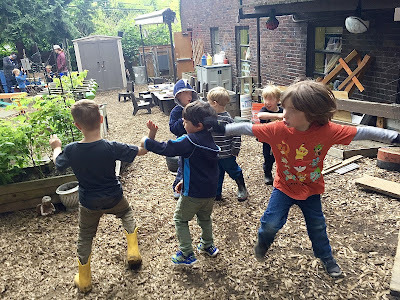 I was drawn to it because, like I said, it is unusual to see on our playground, but mostly, speaking honestly, because I'm one of those adults and I guess I figured I should stay close because I expected they would need me to scuttle things when they got out of hand. As it turned out, they didn't need me at all. There was one bad guy against three good guys. That's where they started. The good guys, rather than ganging up on their single opponent, were taking turns, throwing semi-slow motion punches, which our villain defended himself against with his own pulled counter punches. They were making actual contact with one another, and not lightly either, but mostly on the arms and hands. In fact, they were all very careful about avoiding contact with faces and body-contact was limited to an occasional kick to the shin or slap on the back. Soon the play took on a sort of rhythm with flurries of action followed by pauses during which they spoke about what had just happened and what was going to happen next. Naturally, I thought of puppies wrestling with their litter mates, playing at the skills, developing the instincts, and building the muscles that their evolutionary program tells them they will need as they grow older. 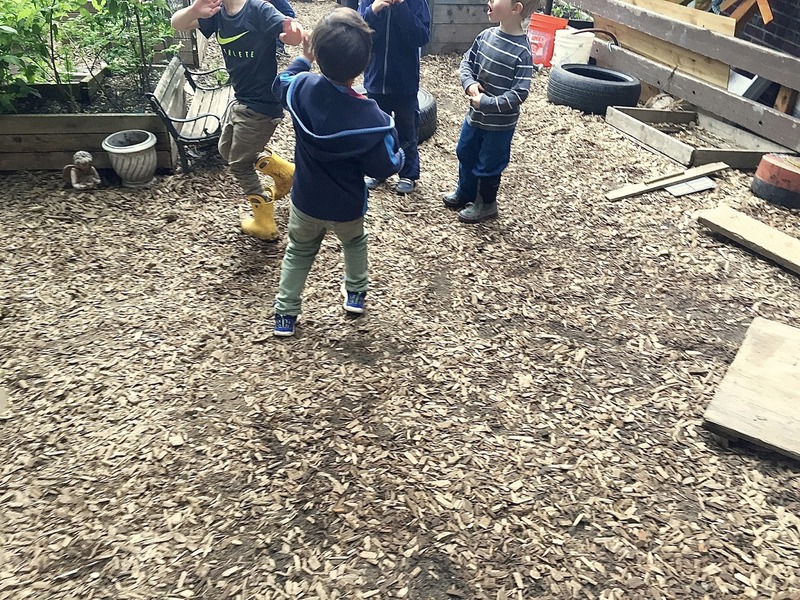 And while I hope that actual fighting isn't a big part of these kids' futures, there is no doubt that their play fighting is a proper preparation a future among the other human beings, where negotiation, cooperation, and agreement are the real secrets to success.